Walking is a nice way to travel. Walking aimlessly, without trying to get somewhere quickly can be most delightful. In a kind of slow travel there is time to look and watch. 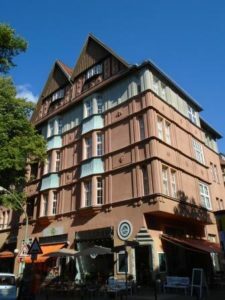 Whenever I take a stroll through the city – which happens less frequently than I would hope for – it’s like visiting a place for the first time: I appreciate little flower beds in front of houses, beautiful facades, shops I never noticed before. As I am a compulsive reader I read signs. Passing by quickly at my usual pace, I catch a glimpse of these but rarely feel inclined to a closer look. Strolling is different. I take my time to walk up for scrutiny; at times I even take a picture and may follow up with a little internet research. In many cases the mind will start to wander while my feet do likewise as I digest the information. 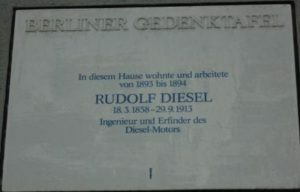 Owing to the current scandal about emission manipulations I just couldn’t resist beginning with Rudolf Diesel, the inventor of the eponymous engine. 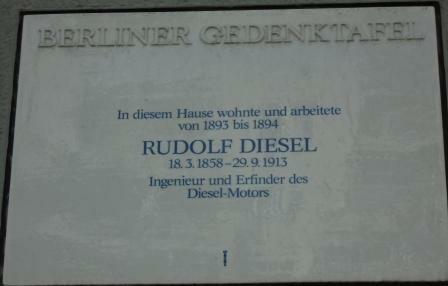 Though he lived and worked here for only one year, it was obviously worth mentioning. In the house next door there is yet another plaque. 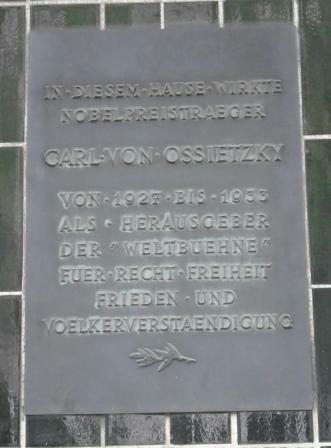 This one is dedicated to Carl von Ossietzky, a writer and publisher and inveterate pacifist who left his mark in the Weimar Republic, the short span of democracy between the end of WWI and the Nazi era. Put into a concentration camp, Ossietzky was awarded the Nobel Peace Prize in 1935, much to the dismay of the Nazi rulers. 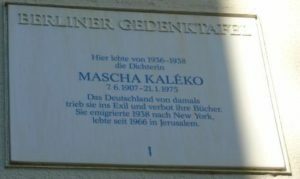 Just a few streets away there is a tribute to Mascha Kaléko, an urban poet, whose works encapsulate the atmosphere of Berlin’s 30ies. Driven into exile she masterfully continued to put her feelings and perceptions into verse. Here’s a case of where noticing the sign sent me to the book shop to buy two of her anthologies. But it is not just people that are commemorated by the signs, but some institutions as well. Last year, after having gone out for a drink in a bear garden close to the Chancellery with some colleagues, I came across a sign that immediately sobered me up. The building referred to is gone, but during the Nazi era it was the seat of the “Vermögensverwertungsstelle”, a branch of the revenue service that dealt with registering and confiscating the assets of people persecuted on racial or political grounds. But I do want to end this one on a more cheerful note: Christopher Isherwood’s stay in Berlin is celebrated with a plaque in Nollendorfstrasse in the midst of an area bustling with gay life. 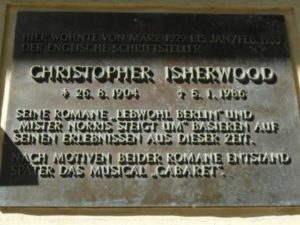 You may not have read his novels “Goodbye To Berlin” or Mr. Norris Changes trains” but there is no way you haven’t heard of “Cabaret”! Well, the musical is based on these two novels. Have a nice stroll next time you’re in Berlin. Want company? Our guides will be most pleased to come along!